West Los Angeles has its fair share of taco trucks, and 3 of them routinely stop along Santa Monica Boulevard between Bundy and Barrington. I tend to go to El Paladar Oaxaqueño, partly because it’s really, really good, and partly because it’s on the right side of the road for me when I’m going home from Santa Monica. 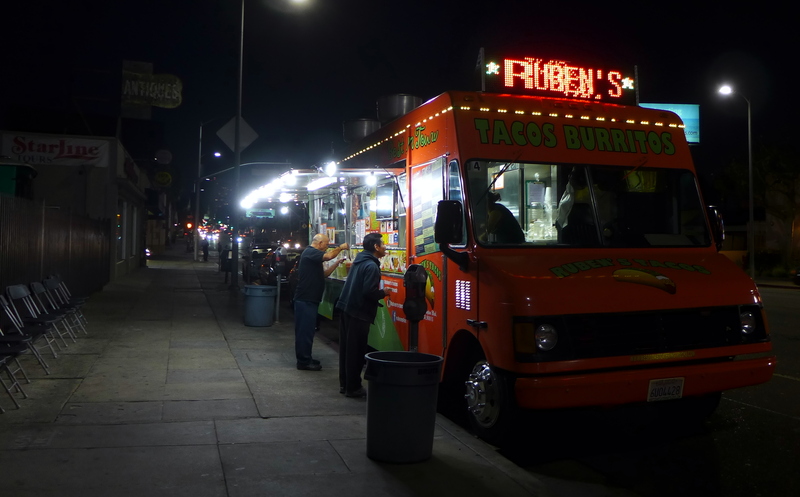 Tonight, I decided to cross the road and try Ruben’s Tacos, a bright red and green truck with flashing lights that you just can’t miss. 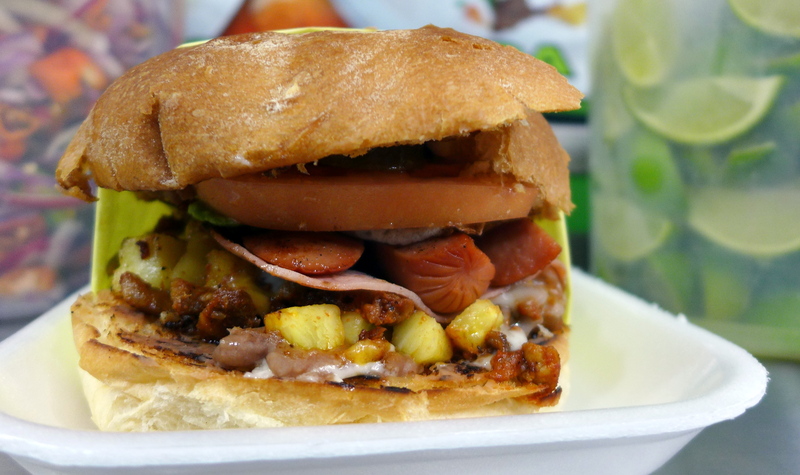 I was going to go for the huarache, but just in the nick of time, spotted a picture of an outlandish-looking sandwich called the torta cubana. I have a weakness for tortas cubanas. Whenever the Mexicans want to create an absolutely insane sandwich, for some reason I have never learned, they blame it on the Cubans. I’ve had many in my time, and each one seems just a little crazier than the last. The Torta Cubana at Ruben’s takes the cake… and cake is just about the only thing they didn’t throw into the mix. I wasn’t surprised by the breaded beef cutlet, the “pastor” marinated pork, the sliced ham, refried beans, avocado, tomato, grilled hot dog or fried egg. I was surprised, though by the mayonnaise, pickle and yes… pineapple. I felt like the enormously obese customer in the Monty Python sketch who orders everything on the menu, then explodes at the end. It was a great sandwich, and I know I’ll be returning to do it again… just as soon as I stop feeling guilty about this one. The truck parks on Santa Monica Boulevard at Westgate. It seems to be there every evening. This entry was posted in Food! and tagged Los Angeles, Ruben's Tacos, Taco Trucks, tacos, Tacos al Pastor, Torta Cubana by brucecritchley. Bookmark the permalink.